The freezing Q1 weather and then the bucket loads of rain in April have done no good to high street retailers. The ONS today blamed the inclement weather for a 1.3% drop in retail sales, but did point out that volumes were 0.5% higher than in April last year. The year-on-year rise may sound like good news, but unfortunately it’s considerably less than the 1.2% analysts were expecting. So no silver linings here. The ONS said food sales plunged 4.1%, accounting for the bulk of the fall, mainly because summer ranges of food (mainly designed to stick on the barbie) were hardly selling like hot cakes while the rain continued. Garden furniture also took a hit. In any case, this is the worst drop in food sales for about two years, and ripples from these worse-than-expected figures were felt in the City this morning. The news prompted a sharp drop in the value of the pound, 0.5% against the dollar to $1.5083, which is a seven-week low. 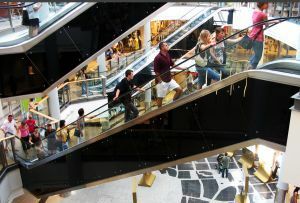 It is worth noting that earlier this month, however, the British Retail Consortium reported rather worse figures for the period: retail sales down 2.2%. In this situation, it’s hard to know who’s right. A disparity of 0.9% is pretty serious, although probably not outside the margin of error. If we were being cynical, we might guess that the ONS (being a government agency) is under pressure to massage the results, but what do we know?